To Realf on the "Ships starting with R" page. Tonnage: 8083 gt, 12 550 tdwt. Dimensions: 467.6 x 59.8 x 34.6 ft. Delivered in May-1937 from Kockums Mekaniska Verkstads A/B, Malmö (194) as Realf to A/S Asplund (Rønneberg & Galtung), Moss. Single propeller powered by a 6 cyl. oil/diesel engine, 1162 hp, cruiser stern, 2 decks, 16 watertight bulkheads and a superstructure consisting of a 31.09m poop deck, an 11.28m bridge deck and a 13.11m forecastle. Dimensions: 142.49m length, 18.18m beam, 10.51m draught. Struck a mine on Nov. 30-1939, laid by a German destroyer. 1 died. Sank on Dec. 1-1939. According to "Lloyd's War Losses, Vol I", she was on a voyage from Philadelphia and Kirkwall for Thameshaven and Copenhagen with a cargo of 6444 tons gasolene, 3400 tons petrol and 1608 tons kerosene. Arnold Hague has included her in Convoy FS 45 at this time (external link). A visitor to my website has told me that "Shipwreck Index of the British Isles" states that she lies 15 miles off Hornsea, S. Yorkshire in 53 54 38N 00 25 04E. Ron Young (see sources at the bottom of this page) gives the location as 17.30 n. miles NE from Withernsea, at a depth of 44 m.
"1st December 1939 Lifeboat, 'The H. F. Bailey' Tanker, 'Realf'. Shortly after 7 p.m., on the 1st December the Coxswain received information from the Coastguard at Cromer that a vessel 2 1/2 miles North of the Station wished to land a crew which had been rescued. Upon arrival at the vessel, which proved to be the Santa Gata of Napoli, the Coxswain was informed that 32 men of the Norwegian tanker Realf wished to be landed, also 10 Naval Ratings (2 officers and 8 men) of Kirkwall who had been on board the Realf when she was mined. They were taken on board as soon as possible and landed at the Slipway about 10 p.m. It is believed that the men had been picked up by the Santa Gata near Flamborough Head". The poster of this message is looking for more details about the captain and crew, so if anyone can help, please contact me via the e-mail address provided at the end of this page. (I've suggested he contact the Norwegian Maritime Museum and/or the National Archives. The addresses can be found towards the end of the main page of my ship lists). Norwegian tanker Realf (8083 tons) while being taken under armed guard from Kirkwall in convoy struck a mine when greatly off her course about 18 miles N.N.W. of Outer Dowsing Lt. V. Was set on fire. Cargo - petrol and oil. Position 53.49N 00.30E. One Norwegian officer lost, remainder 2 officers and 8 seamen of prize crew and 32 Norwegians picked up by Italian ss Santa Gata then transferred to lifeboat and landed at Cromer. (N/C Yarmouth 2250/1) Still afloat 2030 (F.O. Humber 2320/30). ss Valdirosa (Italian) reported her on fire 0500/1 (Humber Radio 0525/1). Two Naval ratings injured (F.O. Humber 0350/1). (I have no information as to why she would have been taken as prize). Back to Realf on the "Ships starting with R" page. Other ships with this name: This company had previously had another ship by this name, built in 1918 as War Rajput for British owners. Sold in 1920 and renamed Conia, later Athelbeach from 1925 (still British). Sold to Norway in 1929 and renamed Realf for A/S Furulund (Odd Berg), Oslo, then from 1930 owned by A/S Asplund (Rønneberg & Galtung), Moss. 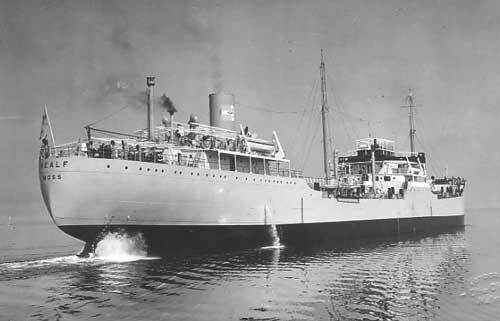 She had British owners again from the fall of 1935 and was renamed Athelmere in 1937, then sailed as Panamanian Alexandros from 1951, broken up in 1964. See also Realf II. Additionally, Sigval Bergesen's Storfonn, laid up in Sweden from 1940, was renamed Realf for A/S Asplund (Rønneberg & Galtung), Moss in 1956. The text on this page was compiled with the help of: R. W. Jordan and "The Comprehensive Guide to Shipwrecks of the East Coast 1918 to 2003" by Ron Young, w/author's permission - and misc. other as named within the above text.